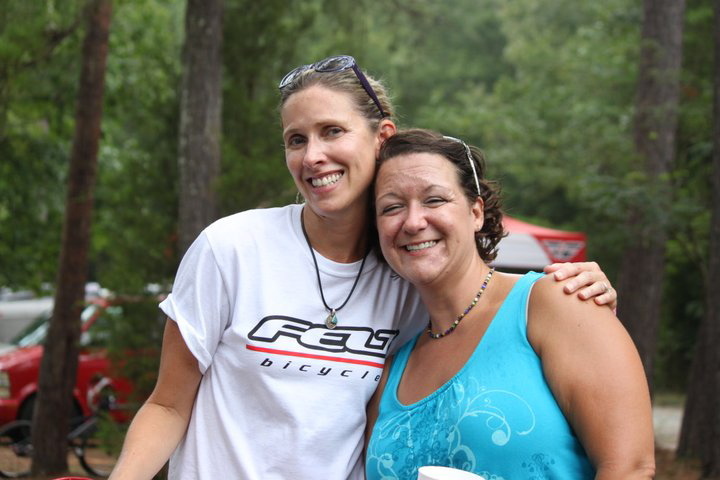 Last weekend the Southeastern BMX community came together at Oak Mountain BMX in Pelham, AL to celebrate (and mourn) the final NBL SE Regional Championship. Because of the new and unbendable (ha!) 2011 rules, many riders, including mine, were not qualified. Unlike many, we knew going in, and registered both boys for their respective open classes, in order to prepare them for the national qualifier on Sunday. Wyatt and Brady battled it out in 8-9 open. Racing seemed somewhat secondary as the fun commenced. Our family gathered with some of our oldest and dearest BMX friends, the Greens and the Wolfs. We welcomed my cousin Joan Beth, a Birmingham local and excellent freelance photographer*, who came to visit and photograph the boys. We even had a visit from our old high school pal Chad Johnson, who we hadn't seen in 20 years, but still shared his cold beer with us like it was yesterday. Grant and William dominated 10-11 open. On Saturday, to make things more interesting, the Greens registered their boys Grant (10x) and Brady (9x) in open class with William and Wyatt. 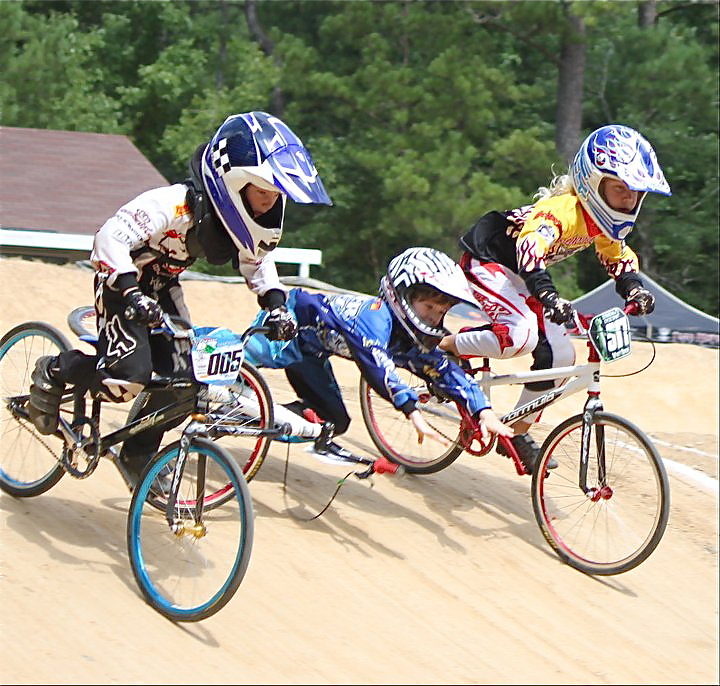 All four boys raced hard on the track, and played just as hard off. Post race, we lingered at the track for hours, sharing barbecue and swapping race stories, while the boys explored the woods. The party continued well into the night, eventually relocating to the home of the Johnson family in Pelham, where we carbo-loaded the boys with pizza. 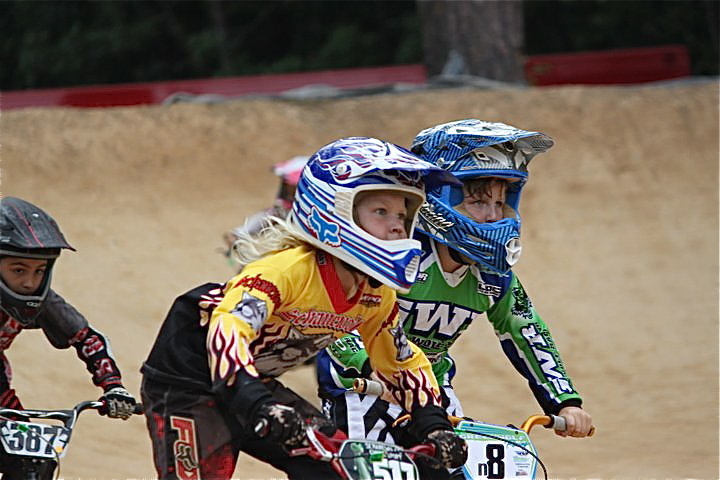 Grant and William pushed each other hard on Sunday, sharing all motos in 10x and cruiser. 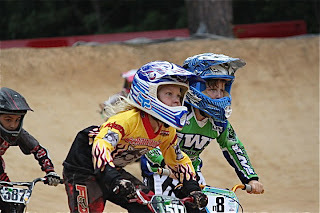 It is always fun to watch these two, knowing they've been racing one another since the age of 5, each mindful of the other, but neither one giving an inch. I bet this little guy will wear gloves from now on! 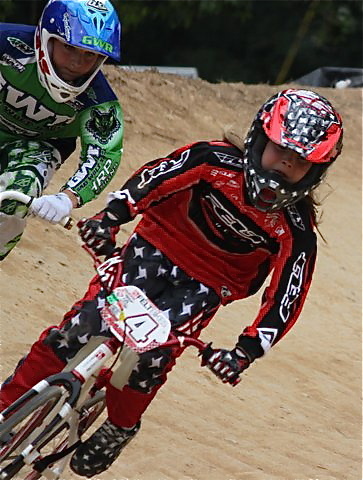 Wyatt continues to exhibit rapid development in speed and skills, as evidenced by his 2nd place cruiser finish on Sunday. He rode hard against tough competition in 8 challenger, and finished 4th. Eat your heart out MG.
Mandi: "You do know that I am Wonder Woman, right?" Me- confused: "Um. No you're not. I am Wonder Woman." 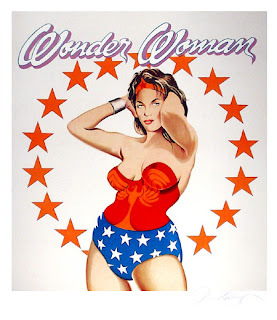 Mandi- indignant: "How can this be when I AM WONDER WOMAN." Me- snotty: "How many Wonder Woman t-shirts do YOU have? I have seven-- top THAT." William- perfectly timed: "She's not lying Miss Mandi." Then I proceded to blow her mind by primping myself with my limited edition Wonder Woman lip gloss neatly contained in my Wonder Woman cosmetic case. You'd have thought I revealed the golden lasso. Mandi has promised to reveal her true self at the Grands by sporting her Wonder Woman outfit. Please, dear readers, make sure you remind her of this promise. The boys ditched the sand and water when William and Grant discovered that the X-Games were on at the bar. As the sun set, the bartender passed them a round of Shirley Temples, while they sat wide-eyed and happy, watching their heros. After seeing them together like that, somehow I knew this was only the beginning. *All photos in this post are courtesy of Joan Beth Smith unless otherwise noted. Good times! Don't worry, I won't forget about the big reveal Grands weekend. Tell Hulk I need him to give Spider Man some gift giving tips.